The Sunrise Hotel Rhodes is a luxury 4-star hotel in Lindos, Rhodes, Greece. The hotel overlooks the Aegean Sea, making it a dream, ideal location for a bright and sunny vacation. The nearest beach is 250m away from the hotel. 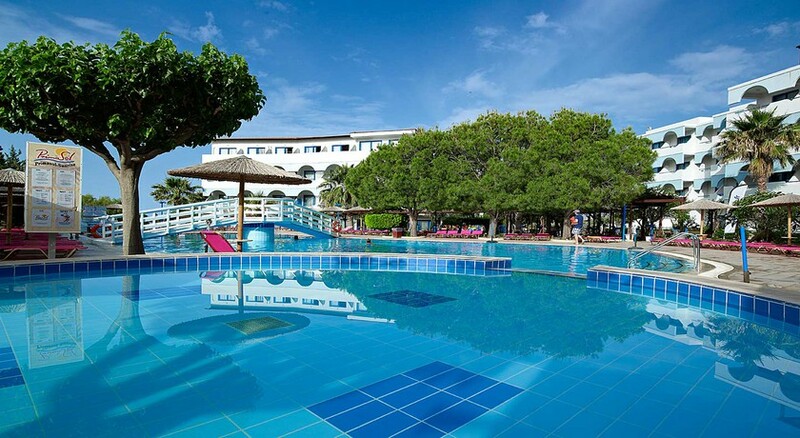 It is an ideal holiday location for both families and couples. The luxury hotel houses an outdoor swimming pool and kids’ pool, and its proximity to the beach makes for an ideal destination for vacationers looking for a sunny, exquisite holiday. The hotel has a modern, chic architecture with 143 spacious and well-ventilated rooms, giving the guest a feel of a real beach vacation. The proximity of the property to the town allows the guests to enjoy the local lifestyle of Greece. The hotel houses several onsite restaurants that serve local and international cuisines and bars that serve an assortment of local and international wines and cocktails. The Sunrise Hotel Rhodes is located 55.5km away from the Rhodes International Airport. The closest beach is just 250m away from the hotel. The property, which is located in Pefki, is located 6.5km away from the town of Lindos. The town of Lardos is 3.2km away from the hotel. The hotel can arrange rental cars for the guests for local outings and pick-up and drop to the airport. The Sunrise Hotel Rhodes has 143 tastefully decorated rooms, which are spacious, bright and well-ventilated, giving the guest a perfect feeling of beach vacation. The rooms are of three types: Double Rooms, Family Rooms and Family Rooms of Two Spaces. All rooms are equipped with television, air-conditioning, kitchenettes, crib (on request), fridge, telephone, coffee and tea making facilities, among others. The bathrooms are also equipped with bathrobe, slippers, hairdryer and essential toiletries. The rooms also have an attached balcony with mesmerising views of the Aegean Sea. 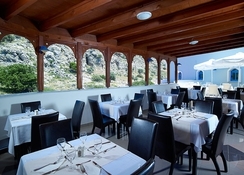 The main restaurant of Sunrise Hotel Rhodes serves buffet breakfast, lunch and dinner. Breakfast is continental in style. The lunch and dinner that are served are of various international and local Greek cuisines. The guest can also try alcoholic beverages with their meals. The hotel houses a main bar and a pool bar. The bars serve light meals and snacks along with drinks and mocktails. The bars also serve an assortment of local wines and cocktails. Also, the guests who opt for the all-inclusive package can avail hot beverages, soft drinks, alcoholic drinks, snacks, ice cream between at the onsite eateries. Vacationers looking to try local cuisines in restaurants outside the hotel, can also visit the towns of Lindos and Lardos, which is close by. Sunrise Hotel Rhodes is an ideal destination for vacationers looking to have beach holiday and indulge in water sports. The guests can try out activities like snorkelling, scuba diving and fishing. There are plenty of water sporting activities the guests can indulge in. Activities like trekking, hiking and cycling are also quite popular among the tourists in the area. Water sporting activities like water volleyball, water gym and water polo are also offered at the Sunrise Hotel Rhodes. The guests can enjoy sunbathing and some leisure time on the closest beach which is at a walkable distance.